You are here: Home » Will one per cent suffice? Will one per cent suffice? According to the recent synthesis report for the World Humanitarian Summit (WHS), research “indicates that at least one per cent of humanitarian spending should be invested in research, evidence and innovation.” It is laudable that the humanitarian system wants to quantify its dedication to a more evidence-based approach and innovation in this way. Such an investment also has the potential to support the call in the synthesis report for increased effectiveness. But it’s worth asking the question: is one per cent of humanitarian spending sufficient to take innovation from the initial ideas to improved outcomes at scale? To help answer this question, we can look at the WHS submission from Deloitte, titled “The Humanitarian R&D Imperative”. In the executive summary, Deloitte conclude that “the humanitarian sector’s current spending on research and development (R&D) – a key driver of innovation – is fairly low compared to other sectors.” They assert that “there was consensus that more investment in innovation and R&D has the potential to help the humanitarian sector more effectively serve affected populations.” By comparing R&D intensity and investment across different industries, they conclude that “to match even low-tech industries’ spending on R&D, humanitarian actors would have to invest $75 million in R&D annually.” Deloitte assign these ‘low-tech’ industries the OECD classification of low, indicating a R&D intensity of under one per cent. Could this be the one per cent that the WHS synthesis report refers to? Is the humanitarian system aiming to take its R&D commitment beyond the ‘low-tech’ industries? 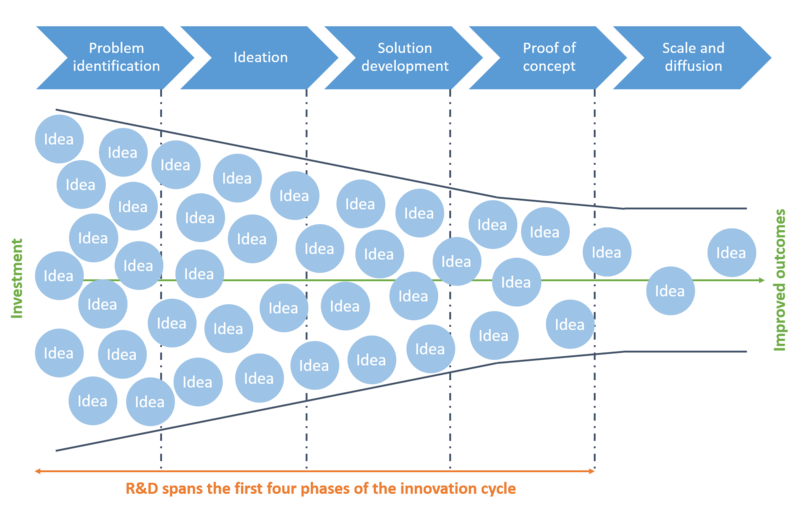 If so, it is important to note that when Deloitte talk about one per cent they only refer to the first four phases of the innovation cycle, as shown by the innovation funnel. The WHS Synthesis report does not specify what part of the innovation cycle it is targeting with the one per cent of humanitarian spending, but gives the impression that it is referring to the entire cycle. Investment is needed throughout the cycle, including in “scale and diffusion”, identified as one of four critical success factors for innovation in the humanitarian sector. The WHS provides a unique moment to achieve a more specific, system-wide, consensus on the size, timing and objective of investments in the innovation cycle for the humanitarian sector. Image credit: Deloitte, World Humanitarian Summit, The Humanitarian R&D Imperative: How other sectors overcame impediments to innovation (New York, Deloitte, 2015), page 7. Investment in strong evidence to substantiate the effectiveness of any innovation is mentioned as another critical success factor. The other two are leadership, including the provision of funding, and an enabling environment to facilitate R&D. By identifying these critical success factors, Deloitte provide the humanitarian sector with some guidance for investment. They provide more detail than assigning one per cent of the humanitarian spending to broadly defined activities such as research, evidence and innovation. Defining the different phases of innovation for the humanitarian sector and identifying the key areas for improvement will allow for targeted investment towards improved outcomes to increase the overall effectiveness of the humanitarian sector. Reading the Deloitte report gives the impression that allocating one percent of humanitarian spending to research, evidence and innovation will not be enough to improve humanitarian outcomes through evidence based innovation. Aiming to outperform ‘low tech’ industries in their R&D intensity can be perceived as a modest ambition, but even this would require the humanitarian sector to go beyond the one per cent recommended in the WHS synthesis report. At least one percent of humanitarian spending would need to be allocated to the four R&D phases in the innovation cycle alone, excluding the often expensive final phase of scale and diffusion. Additional funding will be needed to address this phase and to cover all the critical success factors identified by Deloitte. Jeroen Jansen was appointed as the first Director of Evidence Aid in September 2015. He is the former Head of the Programmes Unit at Médecins Sans Frontières (MSF) in London and a current board member of MSF Spain. 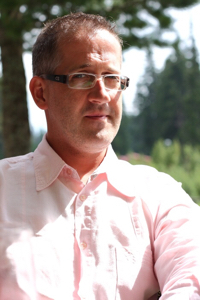 Jeroen has championed an evidence-based approach to humanitarian aid. His many field assignments for MSF in countries such as Afghanistan, Liberia, Nigeria and South Sudan gave him first-hand experience of the need for evidence in the field. In his recent role as Programme Manager Pakistan with Marie Stopes International. World Humanitarian Summit secretariat, Restoring Humanity: Synthesis of the Consultation Process for the World Humanitarian Summit (New York, United Nations, 2015), page 122. Doing this is partly substantiated by the reference to the submission from Deloitte on page 118 of WHS report. Deloitte, World Humanitarian Summit, The Humanitarian R&D Imperative: How other sectors overcame impediments to innovation (New York, Deloitte, 2015). Deloitte, World Humanitarian Summit, The Humanitarian R&D Imperative: How other sectors overcame impediments to innovation (New York, Deloitte, 2015), page 1. Id. at page 3 and 4. Id. at page 17 and 18.